I am afraid the vibration I wa feeling for the last few days riding is the rear sprocket bearing and on inspection this morning we decided to replace it. Our friend’s brother Ahmedi, with whom ne shares the family taxi, came to our aid and we raced around the sleepy Luxor, as it was still early looking for a replacement baering and then some Egyptian ingenuity to remove the old one and squeeze in the new. 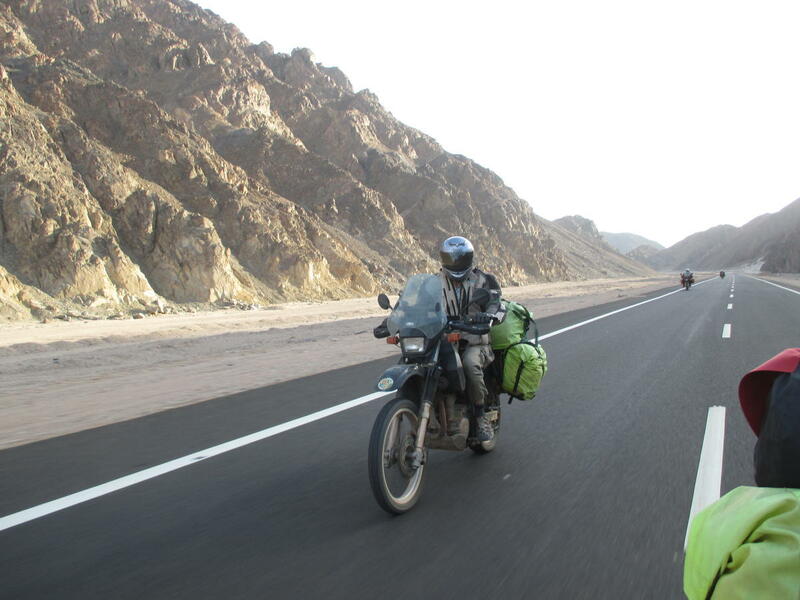 All achieved in two hours and the bike together again we headed north along the Nile again and then struck east on a smooth fast new highway through the desert down to the Red Sea. We were all thrilled to see the sea again and were amazed as we rode toward Hurgarda at the amount of hotel and resort developement. Tens of thousands of apartment blocks, hotels, resort and beach clubs are being built all with the anticipated boom time that is surely to come.